Pacatatucotianao is an online multiplayer game designed to motivate students to study themes related to Brazilian social and physical geography. Each player assumes the identity of a secret agent that is sent to Brazil in order to look for the cure of a strange new virus that has been spreading across the world. The game consists of sequencing non-linear scenes, each including different themes characteristic of the Brazilian curriculum for primary education. As they advance in the game, players create unique stories that are entangled with those of other players. This academic project was carried out with the help of Jean Piaget Educational Center in Rio de Janeiro, and includes audio tracks by Alexandre Fenerich. Check out the Demo or see more information on the Scenario, Story, Navigation and Structure of the game. 1) Players can access the Pacatatucotianao website, enter user name and password, check their previous scores and chosen agents. 2) They can then pick up an agent and customise his or her appearance. After that they have the option to join a team. 4) The game starts. 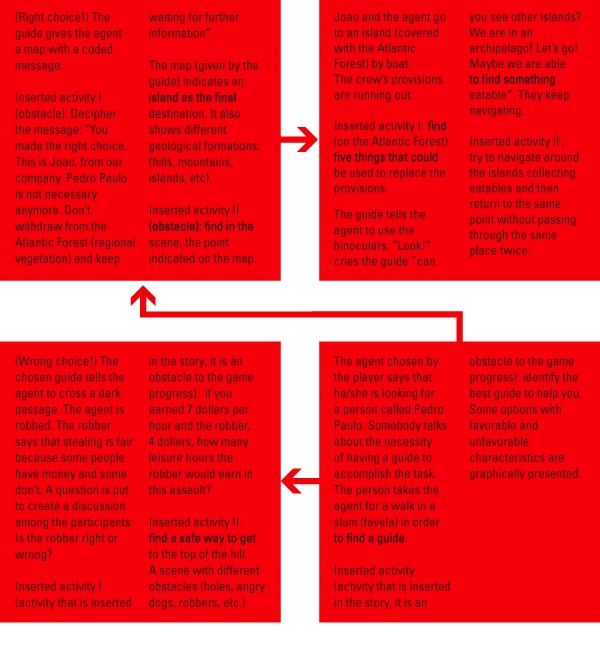 Each player enters the narrative through one of the five starting points of the game. 5) In each scene, they will carry out activities to which they are rewarded different amount of points. Parallel activities sometimes emerge within the team. The aim of the secret agents is to find the cure for a disease caused by a virus, Bizum, which has been spreading all over the world. The mission was requested by an international laboratory, which has been unsuccessfully researching a drug against virus. The laboratory decided to request when historical documents have been discovered, suggesting that an Indian tribe had overcome a similar disease in the 16th century. The game consists in different scenes where players encounter problems or tasks that refer to themes characteristic of the primary education curriculum. 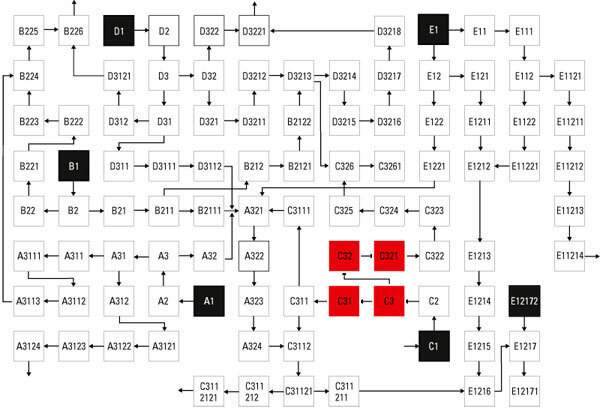 Each scene can lead to different paths and are sequenced according to the choices or the way each player responds to the presented problem or task. Eventually players also receive tips on how to advance more quickly towards the accomplishment of the mission. Although scenes and tasks have been defined, the structure of the game remains open so that new scenes can be defined in the future. The diagram on the left presents the scenes defined during the project. 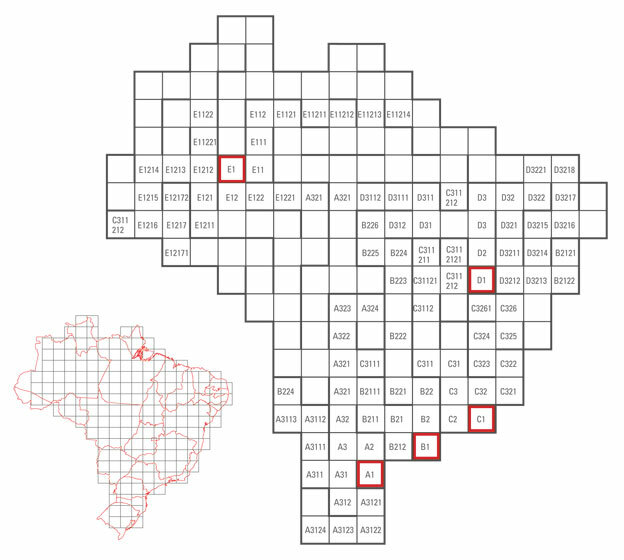 A1, B1, C1, D1, and E1 are entries into the narrative corresponding to the cities in Brazil. E12172 indicates the end of the mission. See the description of the scenes highlighted on the diagram. Developed within the proposal of Empowerment through information, Pacatatucotianao was the final project of my undergrad studies in Design. It was supervised partly by Goebel Weyne at ESDI, and partly by Boris Müller at University of Applied Sciences Potsdam. The sountracks were composed by my good friend Alexandre Fenerich.